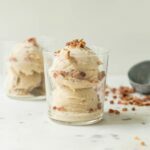 This maple bacon ice cream tastes just like the name! With hint of bacon and bits of the real thing, you’ll love the maple flavor that will put you in the mood for breakfast! In a 5 quart saucepan, whisk 2 cups milk, heavy cream, corn syrup, brown sugar, bacon grease and salt. Set over medium heat. As a precautionary note, the brown sugar will cause the mixture to boil over if it is heated too quickly and boiled at too high of temperature. Watch closely and whisk often. Whisk together the cornstarch and reserved 2 tablespoons milk until smooth. Set by the saucepan. As the mixture comes to a low boil, whisk to ensure all the sugar is dissolving. Allow to boil slowly for 2 minutes. Return to heat and whisk until the ice cream is bubbling throughout. Remove from heat and stir in the vanilla extract and maple flavoring. Let cool to room temperature, about 20 minutes. Then pour into an airtight container through a strainer just in case there are any lumps. Chill at least 6 hours. When the ice cream base has chilled, remove from the refrigerator and pour into ice cream maker. Follow the instructions with your maker as they can vary depending on the manufacturer. Insert the paddle and churn until thick. In a KitchenAid ice cream attachment, this takes about 25-30 minutes. When the ice cream has churned, add in the bacon pieces and stir lightly to combine. Scoop into an airtight freezer container and freeze 4-6 hours before enjoying to ensure it is at a good scooping consistency.